Charleston Mayor John Tecklenburg spent much of his career as a businessman and entrepreneur—a family legacy that began with the opening of his great-great-grandfather’s corner grocery store at St. Phillip and Wentworth streets in 1867. Mayor Tecklenburg founded Southern Oil Company in 1978, which he successfully owned and operated for nearly 20 years. Upon selling the business, he was appointed to serve as Director of Economic Development for the City of Charleston, where he helped lead the revitalization of Upper King Street. Mayor Tecklenburg holds a bachelor’s degree in Chemistry from Georgetown University in Washington, DC and also attended the Berklee College of Music in Boston where he pursued his lifelong passion for music and jazz. Since becoming mayor in 2016, Mayor Tecklenburg has been committed to improving citizens’ quality of life and making Charleston a city of opportunity for all. 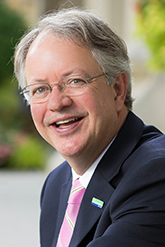 Among his efforts to improve city-wide livability, Mayor Tecklenburg has paid particular attention to flooding and drainage relief, appointing the city’s first-ever Director of Emergency Management and Resilience, and beginning the process of implementing the City of Charleston Sea Level Rise Strategy, which outlines actions designed to make the city more resilient to effects of increased disasters and changing weather. Mayor Tecklenburg has also led initiatives to address housing affordability and homelessness in Charleston. These have including the closing of Tent City, a sprawling homeless encampment that had developed in our North Central neighborhood, and the formation of the Mayors’ Council on Homelessness and Affordable Housing, which works to develop a long-term regional approach to these challenges. In addition, he has championed Plan West Ashley, the largest, most comprehensive renewal and revitalization effort in our city’s history. Modeled after the successful Downtown Revitalization Commission of the 1970s and ‘80s, the West Ashley Revitalization Commission is working directly with citizens to create a master plan that will guide the area’s development for years to come.